In an old paint box, somewhere in my attic, there is a small, bright yellow button with black lettering on it that states: you gotta have ART. That was the catchy, clever slogan in 1976 for the Detroit Institute of Arts, and to this day, those four words resonate deeply where the arts are the warp and weft of a community’s social tapestry. I cannot think of an attraction where that is truer than at the Southern Vermont Arts Center (SVAC) in Manchester. They have plenty of fine art, they have an abundance of the arts, and, I’ll say it: everything about SVAC oozes talent. SVAC has been the epicenter of both the arts and art appreciation in the region since 1950. 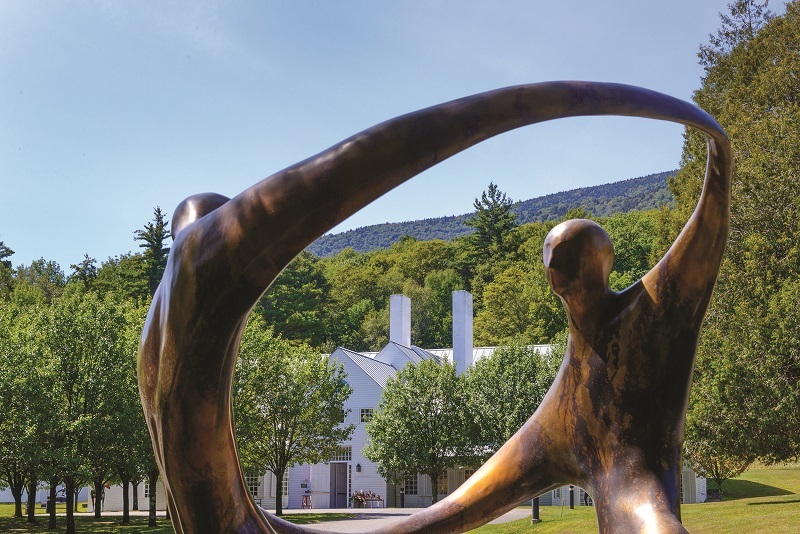 On this venerable estate, the visual arts, performance, creative learning, and the natural beauty that is Vermont have been happily married for decades. It has evolved into a campus with the addition of modern buildings in the late 1900s, but in fact this vast acreage and the 28-room Georgian revival-style mansion was previously the summer getaway of Gilded Age socialite Gertrude A. Devine Webster. It is listed in the National Register of Historic Places. Art in spectacular settings such as SVAC makes people happy and everyone seems to chat up the one thing they like best about the venue. For many, there’s delight in simply taking that steep, slow drive up and down the hillside on the narrow road that winds through a striking display of outdoor sculptures. Many of the pieces stand stoically unaccompanied in the middle of open fields, land long ago cleared for farming, and many more sculptures stand side-by-side with the birches and pines along the densely forested parts of the lane. It’s enchanting. As a center of learning, professional artists and talented amateurs come every season to either teach or to take workshops in all mediums. Some students come to study painting, others to learn to sculpt or to dive deeper into fine art photography. More artists come to SVAC by special invitation to be artistsin- residence, setting up their easels in the galleries or in the gardens to work in full view of the public. Each summer, thousands of visitors flock to SVAC’s 400-seat Arkell Pavilion to attend a variety of musical genres including a five-week festival of chamber music, opera, and orchestral performances by Manchester Music Festival and on Friday nights, Friday Night Live tribute bands fill the campus with music, music, and more music. Those who are totally in the know often drive over to SVAC just because it’s noontime. These visitors sit down for lunch at Chie Addington’s and Katsuko Lord’s Café Sora, which serves home-style Japanese cuisine in a pretty, sunlit dining room and on the canopied terrace at Yester House. Insider tip—try the signature dish, Chirashi Donburi, which is an artful presentation of fresh fish served on sushi rice. 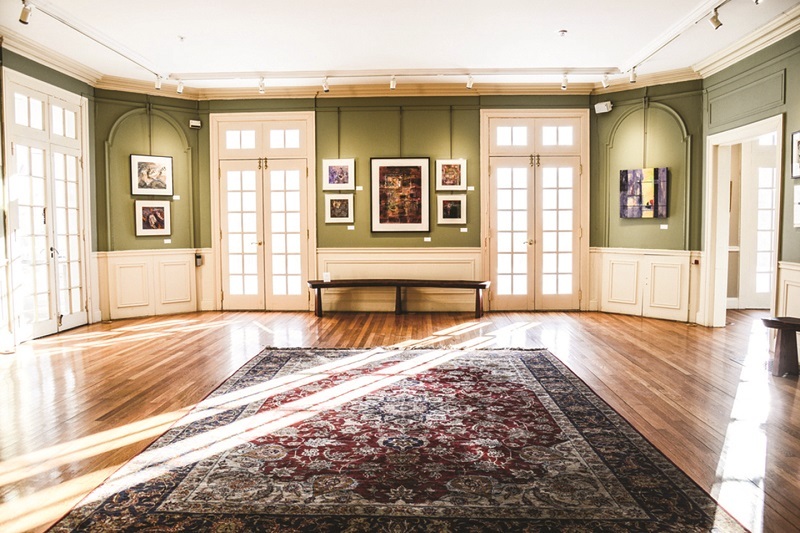 No part of the “show” at SVAC is more exciting and more of an attraction than the vibrant, changing art exhibitions and the permanent collections on display in the historic Yester House and the contemporary Wilson Galleries. These are two of the most dynamic art spaces in New England, enhanced by the largest catalog of works by the acclaimed Italian American painter Luigi Lucioni (1900– 1988). Lucioni, who painted in Manchester, is best known for romanticized landscapes of the Vermont countryside, as well as portraiture and still-life paintings. During July and August, no two Friday nights at SVAC will be alike. At Friday Night Live, phenomenal tribute bands rock the foothills of the Taconic Mountains with the chart-topping sounds of Memphis, the Rolling Stones, and Simon and Garfunkel. Some of the best and biggest local bands take the stage as well. Come for the country, blues, and rockabilly performers. Be surprised, and just come as you are on Friday nights, or follow SVAC’s Facebook page for details. Concertgoers can opt for seats inside or spread their blankets on the grass at the back of Arkell Pavilion. Word is that the Friday night food trucks that line up before the music starts offer delicious, creative menus—first, you eat; then, you rock. Blair Carman and The Belleview Boys Aug. 3 | Rolling Stones Tribute Aug. 10. Tickets available online at svac.org. Admission by donation. Free parking and access to walking trails, grounds, and gardens.